I’ve just come back from three days at the annual IGeLU conference in Oxford, the user group for Ex Libris products. 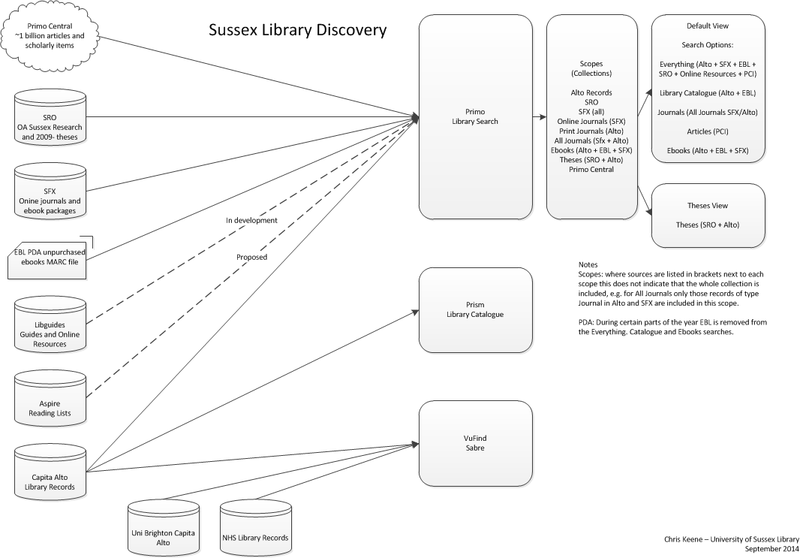 Much of the discussion was around Primo and discovery, and I’ve created a quick v1 attempt at a diagram to show discovery at Sussex. It shows how the different data sources feed in to the various front end products. Click on the image to see a bigger version, or use the PDF below. Worth mentioning that with our new platform, setting up a Union catalogue is but a small configuration change away. Doing more development to pull in availability etc, but might be of interest for your Sussex + Brighton catalogue. Thanks Phil (sorry I missed your comment coming in originally). Have to say when I look at all the web catalogue interfaces out there Prism is by far the nicest in terms of display and ease of use. Real attention to detail, eg i like that as you go through the pagination it loads via AJAX (do people still use that term?) to be super quick. Will look at the union catalogue possibilities again.